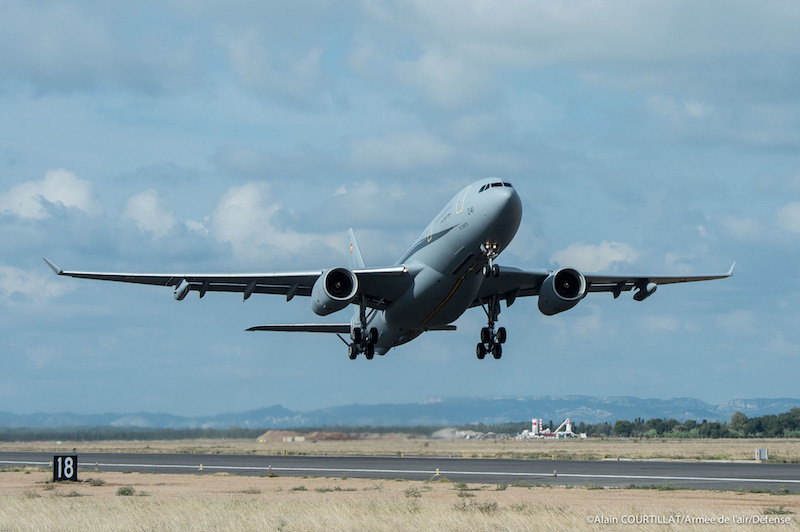 Piloted by a crew of the MRTT team of the Military Aviation Expertise Center (CEAM), the new tanker aircraft made a first flight of flight refueling trial with the aircraft of the 2/2 «Côte-d’Or» Calibration Squadron. This first flight marks the beginning of the experimental and test campaign that will allow the aircraft to be reach Initial Operational Capability (IOC) within a year. Integrated into the 31st EARTS (strategic air refueling squadron), the trial team will perform many test flights to qualify the aircraft for all the missions it will carry out. The first phase will be dedicated to the air refueling missions of the various Air Force aircraft and those of our allies, in multiple configurations, by day or night and in all weathers. Once the refueling capabilities are validated, the aircraft’s trials will be expanded to include strategic cargo and personnel transport and medical evacuation. The Phénix, so named by the Air Force as a symbol of the aircraft capable of «reborning» any aircraft it refuels in flight, will ultimately replace the Air Force’s entire fleet of strategic aircraft (C135, A310 and A340) which are now used for long-range missions. Operated by the strategic air forces, the fleet of 12 aircraft (15 after 2025) will be stationed at the 125 Istres air base, whose role as our «logistics hub» will be increased tenfold. Given that the A330 Phoenix is one and a half times larger than the C135, the entire infrastructure of Air Base 125 has had to be reviewed. A first maintenance hangar, a parking lot and new air traffic routes were thus created at the air base for the reception and implementation of the aircraft. This site, the largest currently in terms of investments for the Ministry of the Armed Forces, will continue to accommodate 12 aircraft by 2023. In addition to two other maintenance hangars, Istres will have a new terminal for personnel and logistics transport missions which are currently carried out by the 1/60 «Estérel» transport squadron from Roissy Charles-de-Gaulle airport.